I originally made this simply because I was bored one afternoon and wanted to make something. I searched through my boxes of junk which were stored in my shed and came across two items which looked they had potential: a chassis from an Edison Amberola X and an old Technics turntable. With some other odds n' ends from my junk box I put together this Poor Man's Cylinder Phonograph... and yes, it really works! I modified the original drive circuit in the same manner as is used to retrofit old stereo turntables for use with 78's and mounted the circuit board and power supply inside a wooden box I threw together. I cut off the end of the tonearm (which was intended for P-mount cartridges) and made an extension and new headshell from brass stock. This was secured with epoxy. The lengthened arm required the original counterweight be shifted back slightly so that tracking weight was around 8 grams. By trial and error I found this to be the lightest that this would reliably track at. I'm sure by changing the arm elevation (and thus changing the angle of the tonearm in relation to the cylinder surface) a lighter tracking weight could be used. The cartridge is a Stanton 500 outfitted with one of my custom styli. 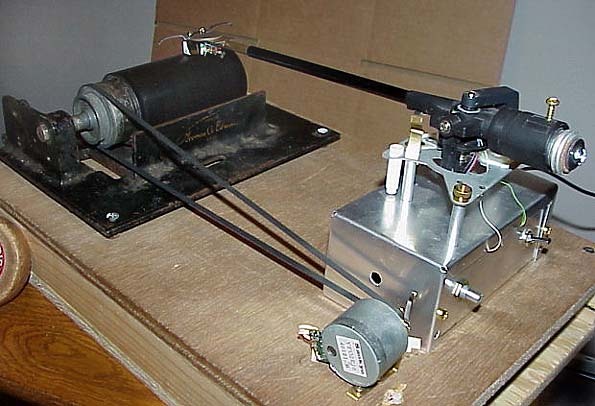 The motor and drive belt are from the Technics turntable. It would have been better to get a shorter belt but this worked out just fine with the long one... and besides, this was supposed to be a junk box project. I couldn't get the motor speed down quite slow enough so I used the edge of the mandrel/pulley as the drive location as opposed to the pulley surface itself. This works quite well and the unit is variable speed from around 100rpm on up. It would be a simple matter to make the unit battery operated as the drive circuit operates from 12 volts. My total cost to make this piece (not counting cartridge and stylus) was all of $25.00. I purchased the bedplate for $10.00 at one of the shows awhile back, and the turntable I picked up at a local flea market for $15.00. Several of the Blue Amberol recordings on my Random Record page were made with this machine. I must say I had fun making this piece but I do prefer to use my ACT pickups in vintage Edison machines for transcribing. The long tonearm creates some challenges playing out-of-round cylinders. Gravity can't react quickly enough to keep the cartridge in place and the result is that it tends to oscillate up and down imparting a slight "wow" to the recording. This is not a problem with the ACT pickups.